Grab your dancing shoes… We’re introducing new fitness dance classes with a Latin twist! A dance workout that mixes traditional and popular movement with music mainly from Cuba, Puerto Rico, and Colombia. It includes an energetic low-high intensity progressive choreography for all dance and fitness levels. No dance experience needed. Free until January, then $7 per class. Similar to Zumba, but with an added twist! This class is open to everybody. Free until January, then $7 per class. Efren is originally from Mexico, but is now based in the San Francisco Bay Area. Amongst all of his talents, Efren is a group exercise instructor, fitness presenter, mentor, and choreographer. Efren has over a decade of experience under his belt, working with and providing loyal clients with engaging group classes. All of his classes are praised for being fun and high energy, while showcasing a diverse workout that will make you sweat! Since 2005, Efren has worked and collaborated with some of the top-notch fitness facilities in Marin County such as the Bay club, Body Kinetics Clubs, Mt. Tam Racquet Club, and the San Rafael JCC. He’s taught a variety of fitness classes including spin, strength training, body-movement, dance, and personal training. Efren has been a licensed Zumba instructor since 2008 and has presented at international Zumba conventions. Although he currently works in the Bay Area, he has traveled internationally to participate in conventions and retreats. Not only has Efren taught Zumba classes for the last several years, but he has also created a new online platform- his own GX mentoring program. His goal of this program is to provide assistance to existing instructors and fitness enthusiasts in preparing a step-by-step instruction manual to be a confident Zumba instructor. 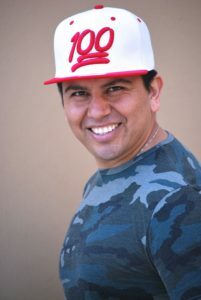 Efren’s evolution in his career is showcased by his website: CHOREOBUZZ.COM, which is a digital platform for dance workout videos and fitness tutorials. In addition, he owns and teaches his own program called Salsa-Regaeton Mix, which is approved by NASM and AFAA fitness associations. This class is now offered at our Corte Madera location! Focus: Body movement, balance, mobility, and flexibility. Mission: To inspire people to appreciate their bodies and treat it as a temple.